IF HANOI IS ALL sleepy, if stately, French colonial buildings, art and literature, Saigon is all bustle and buzz, not always comprehensible to the foreign eye - and until recently dotted with Metro diggings that marooned several hotels behind mounds of earth and trenches, as motorbikes swarmed through the inches of residual space. I pondered the taxi “communication card” handed me by the bellman at a hotel. The conversational phrase list for the passenger ran thus: “Please slow down,” “Please make it cooler,” “Please turn down the radio volume,” and finally, “Can you stop the car? I do not feel well.” This about sums things up. Things can get unexpectedly exciting, so slow down. Keep cool. And all will be well. Much of the metro digging in the city centre is done with a few spots near the Opera still heaving (an underground station is due here). The first of the city's up to six or more Metro lines may be in operation by 2019-2020 with an extension line for Tan Son Nhat International Airport under consideration. Before we get into the meat of our Saigon business hotels review, there are two things you should remember never do in Saigon (Ho Chi Minh City). The first is buying a postcard from a street urchin with a heart-rending story. The second is hopping on the back of a moped driven by an alluring silken-haired lady in a white ao-dai and long elbow-length gloves. Buy a postcard and screaming hordes of kids will materialise from nowhere – with postcards of their own – to make a meal of you. This is the Saigon Serengeti at its most unforgiving. If you’re not the sort that enjoys rugby scrums and are not intimately related to Mother Teresa, walk on. Or make arrangements to have your shoes, buttons and dentures mailed back to your mum in a box. As for the ladies on mopeds – hop aboard, and your wallet may get a bigger dent than you bargained for. The country is changing fast. At Tan Son Nhat, Ho Chi Minh’s international airport, I sank into a comfy chair at the business class lounge and looked around, reassured by the sight of well-groomed staff, all donned in green surgical masks. It's things like this that demonstrate just how serious Vietnam is about getting ahead of the competition. I pointed this out to a fellow passenger, an American, it turned out. "Awesome," he said. An attendant came by in a mask and brought me some tea. Then he pulled his mask off and sneezed, right above the soup tureen. The evening before, after a smoky rooftop barbecue my friends and I had watched karaoke-crazed Koreans downing whisky and dancing merrily, waving strips of toilet paper. Jolly stuff. Just another day in Saigon where nothing is quite what it seems. 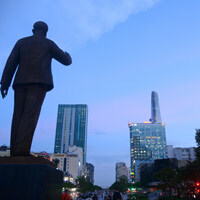 Ho Chi Minh City is the undisputed financial hub of Vietnam. It has come a long way and you can now shop in relative comfort but at wallet-humbling cost in the new malls where duty is seemingly levied by the trillion. 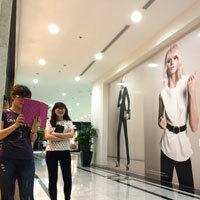 Glittering shops are sprouting all over Saigon sporting Louis Vuitton, Dunhill, Gucci, Calvin Klein, Dior and Chanel. Pounding jackhammers and giant cement mixers attest to Saigon’s arrival as a city that may one day rival other Asian capitals. Hotels and offices are thrusting up impetuously, changing the formerly unruffled skyline. 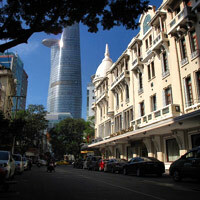 Among the tallest buildings in Vietnam, the 68-storey Bitexco Financial Tower (www.bitexcofinancialtower.com) is a Burj wannabe with a helipad and panoramic views from an observation deck on the 49th floor. It offers offices, restaurants and shopping and an occasional vertical run for tower enthusiasts. The Metro train seems a tantalisingly distant aspiration as the city continues to endure sporadic diggings but the indomitable rise of those Kentucky Fried Chicken outlets is surely a sign of progress. Welcome to Saigon, Vietnam’s Big Bad Apple that throbs day and night with a respectable glow of neon along refurbished and pedestrianised Nguyen Hue Boulevard especially on Friday and Saturday nights as elegant ladies in ao-dais (pronounced “ow-zais”) glide past the new crop of Saigon hotels and eateries, sitting ramrod erect on dainty mopeds. It is a delicate art, and one that is quintessentially Vietnamese. It is a convivial press though when the traffic lights change it seems the Hoover Dam has burst. In some cases, entire families are perched atop their very own two-wheeler. Dine at an elegant French colonial villa and impress your date by ordering a hot Coca-Cola. In Saigon, Vietnam, everything is possible. On then with our Saigon fun guide. Nguyen Hue Boulevard emerged mid-2015 from a frenzied bout of metro digging - for the underground train - suddenly revealing the range of perky hotels along its length, now featuring broad pedestrianised sections with manicured greenery and flowers. Say hello again to the swank new Reverie. The Rex, farther up near City Hall (and the iconic Ho Chi Minh statue with an arm upraised seemingly beckoning the joggers and selfie-stick crowd) has been extricated and now gleams in marbled splendour after having been dug in on three sides for almost a year. Saigon’s Tan Son Nhat International Airport (www.hochiminhcityairport.com) has had a small facelift. It’s roomier, marbled, with an Internet & Games Centre and the obligatory cobras pickled in evil looking liqueurs. It is quite efficient given the red tape. Best of all, arrivals to Vietnam will notice the absence of any arrival or departure forms. You just whizz up to the immigration counter and present yourself. Duty-free shopping options at Saigon Airport include a wide range of perfumes from Chanel, Bulgari and BVLGARI to other exotic brands. Also find Bally, Swarovski, COACH, Tag Heuer, LeSportsac (accessories and handbags), Burberry, Mont Blanc, TUMI, and Salvatore Ferragamo. For duty-free alcohol, a 12-year-old Chivas Regal one litre bottle is priced at around US$38 while a one-litre bottle of duty-free Johnnie Walker Black Label costs just a tad less, or US$36. Or simply enjoy a foot massage at Level 3 on the way out at US$20 for a half hour rub. There's a Burger King here too and an Illy coffee shop. Alas, there's not much to do at the terminal except shop. Pick up some Vietnamese coffee. It's pretty decent. You cannot import coffee here but you can certainly carry it out by the cartload. Along with the speeded up immigration expect cursory security checks for domestic flights where there seems to be no need to whip out your laptop and water bottles for a separate screening. Just send it all through in your backpack or briefcase. . The airport is compact, clean and reasonably efficient (gate to taxi in under 15 minutes if lucky). Getting to town is relatively easy. Drivers with private cars will approach you demanding around US$15-$20 or more but metered taxis right outside the arrivals hall (to your left) are plentiful and will settle for around US$10 (D250,000) for a 30-minute ride downtown to your hotel in the heart of Ho Chi Minh City. The return trip is about the same though some taxi drivers will try and foist a pre-prepared receipt for double this. The more aggressive car rental counters inside the terminal will scalp you for up to US$30 if you look wide-eyed enough. Within the city, taxi meters start at D11,000 or D12,000 or more depending on the state of the cab. This is not a rip-off. Over a medium distance, the prices all even out (Airport Taxi tel: [84-8] 3844-6666, Vinataxi tel: 3811-1111, Mai Linh tel: 3823-2323, or Vinasun Taxi tel: 3827-7178). The centrally located Tourist Information Centre on Nguyen Hue near City Hall disappeared with the Metro diggings and the arrival of Union Square but appeared to have re-emerged by early 2017 at the Saigon Mini Hotel 5 not too far from Ben Thanh Market. 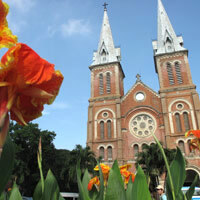 Also check out Saigon Tourist (www.saigon-tourist.com) one of the biggest hotel and tour operators around. Whether it’s a silk ao-dai tunic you’re after or a B-52 bomber compass or a wind-up Russian army watch that actually works, everything is negotiable right down to just this side of zero. Knock-off Ralph Lauren shirts in teeming Ben Thanh market can be had for less than US$5. The exchange rate is around US$1=D22,500. That’s a lot of dong. Don’t change too much and keep lots of small denomination dollar bills. Most stuff is quoted in dollars and, unless you’re a math whiz, it’s far easier working with fewer zeros. 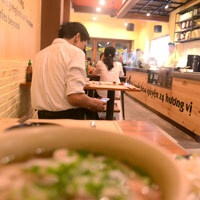 Ben Thanh is a must-see and represents a fair slice of old Saigon. There's tasty street nibbles here too. Upscale Saigon shopping is best experienced along Dong Khoi Street where you’ll find outlets like Prada, Brioni, Roberto Cavalli, Versace, Dolce & Gabbana, Giorgio Armani and other European designer brand accessories. And right across the main street from the Continental is the posh stark-white curving bulk of the classic Union Square with more designer brand shopping than you can shake a stick at. Along Dong Khoi savour hole-in-wall outlets selling chic outfits, and the highly-regarded Khai Silk (tel: 3829-1146, 107 Dong Khoi). Khai Silk is the Vietnamese equivalent of Thailand’s Jim Thompson. They have a good selection for men as well as women. You'll also find them at some of the more upscale hotels. Pick up a accordion crumple silk scarf for around US$65, a silk tie for $60, or a very smart linen half-sleeve shirt for $80. Del Amo (26 Dong Khoi, www.facebook.com/) is a popular fashion outlet store that serves up D&G, Moschino, Roberto Cavalli, Dolce & Gabbana and more. Don’t look at price tags if you’re squeamish. The amazing, if ungrammatical, it's happened to be a closet (tel: 3825-8325, 89 Mac Thu Buoi, itshappenedtobeacloset) has a wildly entertaining assortment of handbags (up to US$1,200), blouses ($245) and colourful bric-a-brac from Thailand’s hugely popular Siam Square boutique. Also look out for Nagu (155 Dong Khoi - gifts and kids' stuff, handbags from D860,000), a bright selection of clothes for children at Ninh Khuong (83 Dong Khoi), and IpaNima (77-79 Dong Khoi), which retails flash designs with Indian inspirations and local flavour. Along Dong Khoi is Saigon shopping at its best. 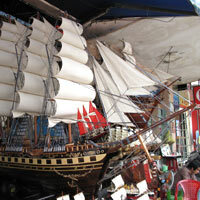 Around the corner from Caravelle as you head right from the main exit is the fascinating Tan Thanh (9 Lam Son Square, tel: 3825-7827) that sells replica wooden sailing ships, large 1.5m models going for around US$90-$100. Across Dong Khoi is a large Louis Vuitton store and a huge Gucci emblazons one side of the Sheraton. Relentlessly upscale is the new shopping arcade that seems to have overwhelmed the formerly sleepy Rex hotel. The hotel has been reborn with glitz and marble as far as the eye can see and high-end watches and designer fashion brands on display include BVLGARI, Burberry, Chloe, Rolex, Cartier, Chanel, and Salvatore Ferragamo. Farther up Dong Khoi opposite the Continental hotel is the Eden Mall with a more posh but not overly pricey collection of fashion and accessories covering everything from jewellery to Zippo lighters. The smart Parkson mall, a block from the Park Hyatt Saigon and right next to the Continental en route to the cathedral, offers upscale choices that are hugely overpriced but are gobbled up nevertheless by local shoppers. 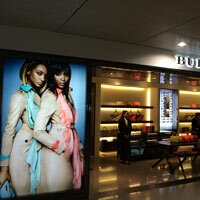 Browse Tag Heuer watches, Timberland, Shiseido, Porsche Design, and Dunhill. Come armed with information as precious little English is spoken though staff will strain to help you. There are information leaflets available. Grab one as you enter and follow the map. Sounds simple but it's a genuine white-knuckle adventure. This is high end Saigon shopping. For upscale Saigon shopping, not far from here is the Diamond Plaza department store that also offers an array of goodies including Furla and Dunhill. The aforementioned Bitexco Financial Tower serves up six floors of high-end shops and restaurants. Start with Adidas on the ground floor. The high-rise Vincom Center (70-72 Le Thanh Ton, District 1) offers shopping and restaurants. At handbag and accessory store Jess (tel: 3822-3670) you’ll find Prada, Salvatore Ferragamo, Furla and Fendi. If clothes are not for you, ogle old but stylish Vespa and Lambretta scooters at 2S. They’ll handle shipping and paperwork. You organise the helmet, the sultry Italian-speaking blonde and the cool shades. Watch out Angelina Jolie and Paris Hilton. On the streets, t-shirts can be had for US$3 or less. Pick up antique-looking second hand Swiss watches for US$250 – of course at your own risk – and knock-offs for around US$20. If you must, there are real watch shops too. 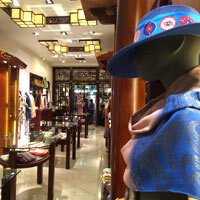 Places like Lucky Plaza on Nguyen Hue serve up handbags by the bushel, silk scarves, and costume jewellery. Hai Ba Trung also features a seamless stretch of fashion shops, local designer offerings and larger wholesale places. Younger fashions predominate, like PT2000. Downtown, at the junction of Nguyen Hue and Le Loi is the large and gleaming Saigon Tax Trade Center, which despite the name, is not a tax-free shopping haven at all. Prices are steep but there is a decent range of goods on offer from jewellery and cosmetics to watches, fashion and some electronics. And it's air-conditioned. Hop in to explore Triumph, Vera, Samsonite and Adidas. The real Saigon bargain shopping action however is to be found at Saigon Square off Le Loi one block up from Saigon Centre. Here, pick up fake watches for US$20-$30 and up, and bargain hard for sports shoes, silk dresses, ao-dais, t-shirts, belts, CDs and DVD films for less than one dollar. If you're looking for fake watches and some genuine second hand antiques, try Dong Khoi where you’ll spot cheerfully brazen displays of knock-off Patek Philippe, Rolex, Omega, Longines, Tudor, Bulova, Movado and more. You might get lucky and come home with a US$30 imitation Patek Philippe (with Taiwanese movement). For cheaper Ho Chi Minh City shopping head to Chinatown and Cholon in District 5 where the giant An Dong Plaza awaits. This is a more local establishment and prices can be flexible. Also in Chinatown, check out Binh Tay market. Another local market worth a peek is Tan Dinh near Vinh Nghiem Pagoda (Nguyen Van Troi Street) in the north of the city on the road to the airport. If you're in search of Vietnamese art, much of it in striking colours, pop by Apricot Gallery (tel: 3822-7962 or www.apricotgallery.com.vn) at 50-52 Mac Thi Buoi Street around the corner from the Sheraton. There is also an Apricot Gallery in Hanoi. Sadly, several interesting art galleries have been squeezed out of Dong Khoi with rising rentals (and high-rises) but the vibrant and contemporary Galerie Nguyen (tel: 3824-2723, 139 Dong Khoi, galerienguyen.net) chugs on. Look out for striking impressionist portraits and landscapes by younger artists like Nguyen Ngoc Anh (who specialises in photo-real bicycles) and Nguyen Hai Anh (impressionist portraits). Much cheaper for bottom-feeders or those simply in search of fun buys are hole-in-the-wall places along Nguyen Hue where a small Mona Lisa replica or even a Homer Simpson portrait – if you are a real art aficionado – will pinch just a modest US$15 from your reluctant wallet. And that’s just the tip of the mad Saigon shopping iceberg. Dining choices are varied and good in this city. Some of the best 'banh mi' or a Vietnamese-style ham in a bun is at the popular and unfussy Huynh Hoa (26 Le Thi Rieng, www.facebook.com) or at the larger Nhu Lan, which is a bakery with other savouries on offer at 50 Ham Nghi Street not far from downtown and the Ben Thanh area. Vietnam House (tel: 3829-1623) with its louvred windows and high ceilings is one of the oldest restaurants in Saigon. It underwent a closure and refurbishment in late 2016 to return late 2017 spanking new under the supervision of celebrated Vietnamese chef Luke Nguyen. The outlet is now managed by WMC, which operates The Reverie Saigon. Here, at 93-95 Dong Khoi Street in District 1, sample Hue-style spicy noodle beef soup or deep fried prawn wrapped in green rice. A decent meal for two should not cost more than US$15-US$25. It's well worth a visit for a brief respite from the motorcycle din and dust. Friendly service and occasional music. Check out the hideaway TIB (tel: 3829-7242, 187 Hai Ba Trung Street) that despite the fish ’n’ chips name has excellent spring rolls and a scrumptious jackfruit salad with shrimp, served up in a secluded yellow villa. For stylish Vietnamese street food and rice-paper rolls in a nice courtyard setting a must-try is Quan An Ngon (138 Nam Ky Khoi Nghia). And for another sampler of Saigon street-vendor food, the sort that is carried around on two baskets balanced at either end of a long pole, visit the Buffet Ganh at the Bong Sen Hotel at 117-123 Dong Khoi. Popular old-timer Quan 3 Mien (122b Tran Quoc Thao) serves up Hue, Hanoi and Saigon cuisine while the friendly and unassuming Pho 24 chain is well known for its pho, Vietnamese beef noodle soup. Pho 24 offers side dishes like spring rolls as well. Spot the upgraded and contemporary woody decor Pho 24 on Dong Khoi. It looks straight out of IKEA and the prices have climbed modestly to 60,000 Vietnamese dong for a do-it-yourself bowl of pho with a large pictorial ordering menu by the counter. Order, sit, and wait to be served. More upscale choices are the trendy Temple Club (29 Ton That Thiep Street, tel: 829 9244, www.templeclub.com) above Fanny's (fanny.com.vn/) ice-cream, and Lemongrass (tel: 3822-0496, 4 Nguyen Thiep St) around the corner from the Oscar hotel off Nguyen Hue. Relaxed and lively haunts include the friendly Ciao Cafe (tel: 3823-1130) at 74-76 Nguyen Hue and a few other locations. Ciao Cafe offers free WiFi, Vietnamese, Italian, sandwiches, and lots of books. Paris Deli, the boulangerie and café is always a safe choice for clean environs and delicatessen treats. You’ll find one on Dong Khoi and at other locations too. La Cantina Saigon (175 Pham Ngu Lao Street, tel: 920-7252) dishes out Mexican if you are on a nacho-and-chilli hunt. It's run by expats so the offerings are authentic. Dong Khoi also serves up the bright and airy Khancasa Tea House for Vietnamese fusion, and the playful Moo Beef Steak for sizzlers and smoke. Walking down Nguyen Hue you’ll spot a Brodard Bakery and an excellent Kita coffee shop (tel: 3821-6799, 39-41 Nguyen Hue), the latter a cosy hideaway for a cup of Joe or a hearty snack. Bier Garden Saigon (125 Dong Khoi, www.facebook.com) lives up to its name with wurst by the mile. ZanZBar on Dong Khoi has closed but the Living Room Café & Lounge (40-42 Dong Du, www.facebook.com) is a trendy watering hole. The smart Xu restaurant and lounge (tel: 3824-8468 or www.xusaigon.com) at 71-75 Hai Ba Trung is always worth a potter and is a notch above the competition on design, quality of staff, attention to detail, and price. This two-floor establishment offers upscale dining upstairs as well as an attractive chill-out drinks and tapas area at street level. Try a Xu Tini (vanilla, vodka, tea, honey and a dash of cream) at the bar. Xu has an interesting food selection that is well presented but a tad fiddly on size when it comes to mains. Sheraton's hip street-side venue Mojo (also on Dong Khoi, or did you guess?) is a hip Saigon bar for starting, or winding up, your evening. 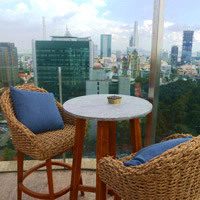 However, to pump up the volume, head for the ninth floor of the Caravelle Hotel where the exceedingly popular Saigon Saigon Bar with its wraparound verandah caters for just about anybody in search of margaritas, pounding live Latino music, and superb vistas. The bar overlooks the historic Opera House. Or check out the newer and narrower street-style The Long @ Times Square by The Reverie (www.thereveriesaigon.com/the-long). Not to be outdone, the very elegant 2 Lam Son at the Park Hyatt is a sensory refuge for the discerning. Make straight for the martini bar and watch the beau monde in action. This is a gloriously textured and unabashedly upscale watering hole that is never in your face. Yes, silence can be golden. Pick a bar stool under a flatteringly soft pool of light or lounge under gauzy drapes. 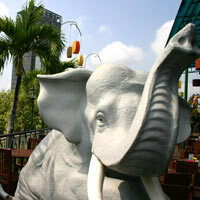 On Mac Thi Buoi near Sheraton are Indian haunts Alibaba (tel: 3823-3594), with halal food, and Bombay. Pretty decent for Indian nosh and always bustling is Ganesh (38 Hai Ba Trung, www.ganesh.vn/) with its varied fare and Chinese touches too. For a smoky and excellent barbecue, try the rooftop Quan Nuong (29-31 Ton That Thiep Street, tel: 908-357-530) above Temple Club. The place is packed and looks like the final scene from the Titanic with everyone running about screaming wild-eyed. Do the same and shout for a waitress. Try the lotus rice and "five spices" beef. Or boil a hot pot. Or just shout some more. There’s more to Saigon nightlife. A happening place at times is the Sax N’ Art jazz club (tel: 822-8472, www.saxnart.com) at 28 Le Loi where you can take in saxophone riffs and Vietnamese melodies. It is a small place with a cosy feel to it. Can get noisy and crowded late. If you want a slice of seedy and throbbing history, try the foreigner-friendly Apocalypse Now (2C Thi Sach Street, tel: 825-6124, apocalypsesaigon.com/), one of Saigon’s oldest bars, where US soldiers hung out while stationed in the city. For those sleepless in Saigon, pop across from the New World to the Catwalk disco (tel: 3824-3760, 8pm-2am) and the adjacent CHATS gaming and casino with its blinking slot machines and roulette tables. The Catwalk disco and karaoke serves up slinky hostesses with legs going up to heaven who will listen to your boring life story for a few dollars per hour (tips are extra). Is your tale worth it? A humungous lift - perhaps once a car elevator - done up like a Disneyland lounge, hoists you up to the reception level where you'll find ladies in strappy dresses waiting to sing with you for around US$10 per hour. It’s cheaper to sing in the shower. And less embarrassing. A few hotels offer some sort of casino operation (for foreigners only). Look out for the Majestic Club at the Majestic, and Club Vegas at Caravelle. Various hotel health clubs will scrub and massage you to silken perfection. One of the biggest hotel massage operations in town is the Windsor Spa & Massage at the Windsor Plaza Hotel that offers 20 treatment rooms. And its America Discotheque runs “from 9pm till late”. Several hotels offer massage services and many are open to non-residents. A clean and not too expensive option is at the Majestic Hotel. Of course, if you still need refined pampering you might try the Jasmine wellness spa (Number 45, Ton That Thiep Street, tel: 3827-2737) not far from the Temple Club where an anti-stress massage will set you back US$25. Sample hot stones, a rice body polish, salt body scrub, and then get a manicure afterwards. Jasmine Massage at the Continental hotel opposite the Opera House is a clean and safe bet, open 11am till midnight with a one hour oil massage priced at around D360,000 (US$16). Your back will get a vigorous workout. A great way to see the city - and grab a few local insights - is by using the services of Vespa Adventures (vespaadventures.com), which prides itself on maintaining a fleet of vintage scooters, some dating back over 40 years. Visit Chinese temples, a 'bird club', do an after dark circuit, or explore the Mekong. It's all possible at around US$72 per person with food, guide, raincoat, helmet, insurance and more. The visually restless may wish to take in the Artinus 3D Art Gallery (9am-6pm, open till 8pm on weekends and holidays, artinusvn.com/). Tickets start at 200,000 dong (or about US$19). Later, finish up your dining and Saigon bars trawl with a postprandial stroll enjoying a kerbside height and weight check by local artificers who trundle their contraptions around town. Before you book into a hotel bear two things in mind. At older hotels the plugs are often French-style two-pin deep-socket affairs that will stymie some adaptors. Secondly, while faster internet connections and broadband are developing fast, general surfing speed often depends largely on how many guests are logged on at any one time. As internet usage in Vietnam tends to be private rather than corporate, nights can get jammed up. We begin survey at the heart of the city at the Opera House. Most of the better establishments radiate outwards from this central district. So here’s the crop of the top Ho Chi Minh business hotels. The metro digging has not directly affected the Park Hyatt, Continental, Sheraton, Caravelle and, farther down, the Asiana Saigon InterContinental. 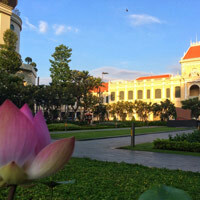 The swish Park Hyatt Saigon, right across the road from the splendid Opera House, returned 14 June, 2015, after a three-month shutdown for a top-to-toe revamp of rooms, public spaces, the pool, and meetings facilities. The good news is WiFi and plug-in Internet is complimentary now for all guests. The décor at the Park Hyatt Saigon is quiet and subtle, classical with a contemporary feel. It is an East meets West palette where most people will feel at home. 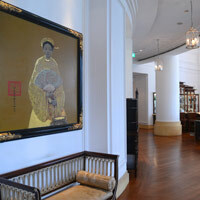 Large Vietnamese paintings adorn walls, and from the lobby on you get an enormous sense of space. There is plenty of natural light. Service is brisk and friendly. Dining is suitably stylish with menus to match. There’s Square One for Vietnamese and great "pho", Opera for laid-back Italian with a small alfresco patch overlooking Lam Son Square (savour fine wine by the thimble or gallon), the clubby yet informal Park Lounge, and the splendidly chic split-level 2 Lam Son that manages to cram in extraordinary detail and texture while still managing to remain understated, dark, and packed with snuggeries beneath gauzy drapes. Check out the martini bar here and run your fingers over etched wood and metal. The Park Hyatt offers 245 bright and spacious rooms with marble-tiled bathrooms and rain showers. Expect rich wood floors with deep tan carpets featuring woven ferns and birds, virginal white louvred windows, bamboo trellises, slim ivory bamboo chairs, cream chest-of-drawers with gracefully curved cabriole legs supporting a large flat-screen television, BOSE sound, Bluetooth, coffee and tea making equipment, a laptop-friendly safe, iron, embroidered silk cushions, and an iPad (for dining menus, not in-room controls, sensibly). There is fast Wi-Fi for those who prefer to stay plugged in. Whether on a leisure trip or a lightning business visit, what's to miss? The small bedside clock with a classical dial remains along with a lazy ceiling fan and a nice wooden biedermeier work desk for that hint of colonial nostalgia. There are two three-pin multi-plug sockets by the desk and one socket on either side of the bed so there's ample charging access for gadgets. The mini-bar houses various libations and a Heineken beer will cost 130,000 Vietnamese dong - double that charged by the Continental). It's the price of luxury. The room is easy on the eye with light tones and an invitingly plump white bed. The bathrooms are well lit so there's no make-up or shaving fumbles in the morning. The glass shower cubicle offers a marble bench for those who prefer to shower slowly, small touches that set this hotel apart as a classy address and one of the best Saigon business hotels. You may find a compact tub too. Perhaps the best feature for frequent travellers are the easy-to-use tactile room control switches. Some rooms have been set aside for the physically challenged and, for those who prefer not to be financially challenged but expect all the perks of a top-drawer five-star, there are specials on offer from time to time. A pillar-less ballroom of 550sq m will set event-planners' hearts throbbing while after hours, business travellers may wish to unwind with a spa treatment, a fitness workout, or some quick laps in the 20m outdoor pool. The third-floor pool area is green with tropical foliage, sunning spots, and meandering paths. Catch some rays. With a location smack in the middle of business and shopping – and entertainment by the block – guests only have to step out to get their city trawl started. Pick this hotel for fashionable events, corporate meetings or just plain old fashioned business travel. It is by far one of the best Saigon business hotels and excels at small corporate meetings too. 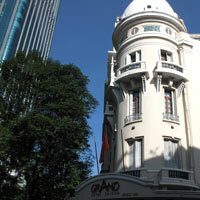 Around the corner is the once undisputed top address in town, the art nouveau Caravelle Saigon that looks over the Opera House for grand views of this green city. This address turned a gracious 50 in 2009 and completed its first phase of enhancements December 2014 with a splendid new lobby featuring cream marble and charcoal inlay. The feel is cool, uncluttered, and contemporary, with a flash of crystal chandeliers overhead and the brisk attentive service that is the hallmark of any stay here. The branded shops and outlets have been muscled out by an enlarged lobby offering generous elbow room for quick-stepping guests to mingle without mangle as they head to Café de l’Opera and the country's very first Champagne Corner in collaboration with Moet Hennessy, this at the Dong Khoi entrance. Spot the Tapas Kitchen too, tucked in streetside. The room renovation planned for several years is still on hold but work is optimistically expected at some point in 2017. When the revamp is executed, in-room the gold-weave fabric and light pinewood of yore will give way to contemporary grey tones with silver accents and dark timber floors. A birds and blossoms mural hold up the head wall offsetting the corporate charcoal elsewhere. Expect white-wood glass-panel wardrobes with muslin 'curtains' as soon as you enter. It's a feminine touch, almost Parisian in feel, that contrasts well with the 'male' Top Suit interiors. There are lots of three-pin multi-plug sockets so road warriors can travel in peace armed with as many gadgets as they require. A plump bed with deep support latex mattress looks onto a flat-screen wall-mounted television and a pillow menu is on hand with everything from contour to buckwheat options for obdurate necks. A rich mahogany table, somewhat compact in size, offers working space accompanied by a pale brown velvet chair and an easy chair for longer reclines. The new rooms promise free WiFi, electric kettles, iron and ironing board, laptop-friendly safe, two 500ml bottles of water, powerful reading lights to keep you going comfortably into the wee hours, floral swirl tan carpets, and a compact but neat bathroom with Thann toiletries, a weighing scale, and rain shower. Access the new rooms using electronic proximity key cards. Perhaps one of the best, if simplest, features of the new rooms, is the ease of managing light switches. These are simple, well placed, and clearly marked. The Kara Spa at Caravelle offers 750sq m of space for wellness treatments along with a 24-hour fitness centre and a terrace pool with swim-up bar. Pop across to the Vegas Club slot machines (casinos are getting big in Vietnam) or, if parked on a Club Floor, retreat to the ninth-floor Club Lounge with its free flow of drinks and evening cocktails and canapes. And you don’t want to miss the signature must-see rooftop Saigon Saigon Bar, which has been operating since 1959 when it held the distinction of being the 'highest' perch in Saigon. The place gets seriously bopping of an evening with Latino music (until 1am six nights a week), dancing, and breezy views in all directions. In all, Caravelle is a brisk address with intuitive staff that, despite its age and occasional creak, ranks high on our Saigon business hotels review. Right behind the Caravelle, at 88 Dong Khoi, the Sheraton Saigon Hotel & Towers is a big, city hotel in every sense of the word. The lobby is traditional with space to swing a horse by the tail. 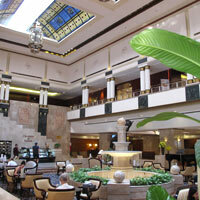 It is a relatively busy lobby, constantly in motion with a lounge bar tucked to one side. Rooms are light and airy with lots of dreamy white and corporate blue. This is very much a business hotel despite the pink exterior. The bathrooms are compact, but the separate shower with waist-level massage jets is a luxurious compensation. The in-room safe can handle a notebook or small laptop, and WiFi may be free with certain packages. The Grand Tower at the Sheraton has 112 studios and suites and this is the premium focus of this address. Grand Tower rooms are kitted out in corporate browns and earth tones with unfussy, contemporary, decor. The Grand Tower check-in is on the fifth floor (this is a separate tower from the main block) and there's a well-lit high-ceiling lounge overlooking the alfresco pool, with evening canapes and cocktails and breakfast. Staff is smart and and the service exceedingly attentive. In a 53sq m Grand Tower Studio expect a dark wood foyer with wardrobes stocking an iron and ironing board, a notebook safe, a roomy sleeping area with a tan carpet, tall gauze curtains with city or river views beyond, a cozy alcove for the work desk and data port with four three-pin multi-plug sockets (there are lots of sockets in the room including on either side of the bed), iPod dock, 42-inch LCD TV, DVD player, Bose surround sound system, pipe reading lights, and complimentary WiFi. The bathroom features a window-side soaking tub and a large cradle-mounted shower. For tired limbs there’s the Aqua Day Spa on Level 5 with all manner of pummelling and unguents available. Other recreation and relaxation options include tennis, squash, and swimming. This Saigon business hotel is well equipped to handle meetings and conventions. For large banquets and conferences, the spacious 739sq m grand ballroom can hold 700 guests (sit-down) or 1,000 (cocktail). The Sheraton Saigon Hotel & Towers offers a total 2,500sq m of space for small corporate meetings, MICE events, or launch functions. This is among the top Saigon conference hotels. Don't pick it for its looks; pick it for service and location at the heart of town, a hop from the Opera House and right next to the shopper-mad Dong Khoi Street. For executives shopping for Saigon longstay residences or in-and-out business travellers, the hotel offers good service and a central location. At the end of the day, enjoy the open views up at the Level 23 Signature Restaurant, gawp from the breezy balcony Wine Bar, or head for the slot machines at the Palazzo Club. Also in the city centre just a block from the Notre-Dame Cathedral, is a jaunty new contender, the Hotel des Arts Saigon MGallery Collection (August 2015), quite a mouthful but a breath of fresh air with a distinct new style. The slim cream building serves up 168 keys including 16 suites in a chic modern Indochina take on things. Curved corners in bedrooms are the first sign that this design is rather different, with its minimalism and panoramic TV-set windows (also with curved corners), all creating a soft and welcoming environment sans sharp corners. Expect gleaming rosewood floors, pale furniture largely in cream and an oversized plain white bed that is inviting in its simplicity. The test of the pudding... dive in. A 30sq m Deluxe has a dark-wood herringbone floor, a generous flat-screen TV wrapped in a large and playfully baroque frame, a small work desk, easy chair, hanging lamps, cream tones and one three-pin multi-plug electric socket on either side of the bed. The plaster scalloped ceiling is a nice touch. The open plan layout leads from the bathing area (at the entrance) to the bedroom with its plump bed. There is a gauze curtain partition. Great for romance, less so for business suits travelling in tandem. There is a notebook-size safe, iron and hairdryer, and WiFi is, of course, free. With photo shoot lights the scene is quietly inviting. But step in and the first impression is of a rather plain space. It grows on you though and as you discover it you'll understand why less is more - not that you are shortchanged on any amenity. If you can, opt for a 60sq m Executive Studio Suite. In general, think neat black trim echoing a fashionable Dior dress, tall windows with dreamy gauze curtains (as in the lobby) and you get a sense of this Parisian style hideaway that should be top of anyone's pick of Saigon boutique hotels. A plaster scalloped ceiling creates texture while occasional flashes of colour offset the pastel mood. The feeling is more home or apartment than impersonal hotel and this is what will click with both business travellers, romantics and the cognoscenti keen on sampling something different and non-cookie-cutter. Hotel des Arts is a small luxury hotel with high standards of service and personalisation, something it is well placed to provide with the small number of rooms and emphasis on guest satisfaction. We rate it as perhaps the best Saigon boutique hotels pick. Also check out a rooftop pool, a spa with five treatment rooms, two meeting rooms, a boardroom and a ballroom that can host 110 banquet-style. Gastronomes will enjoy the Saigon Kitchen with all-day dining, Vietnamese and international fare, and the 23rd-floor Social Club designed by Super Potato with European menus and all-you-can-take-in views. Whether you pick this address as an apres-work bolthole for a chilled drink or a relaxing stay, it is one to mark down in your diary. Meanwhile, moving Saigon's bedroom experience decidedly upscale - and with a classic European twist that will delight some and overwhelm others - is The Reverie Saigon (early 2015). The 286-room hotel is housed in the high floors of Times Square on bustling Nguyen Hue Boulevard (with an entrance on Dong Khoi). With the metro diggings that have brought parts of Ho Chi Minh City to a screeching halt, the opening entrance will be from the shopping street of Dong Khoi until other access becomes available. This is no inconvenience, though modestly less 'grand' than planned. Still, you'll need to turn off your pacemaker and pop a Valium to take in all in the gilt, and crystal and marble and more marble slathered from floor to ceiling like a luxe tiramisu. Once you've absorbed the sight and pushed the jaw back into place it becomes speedily apparent that this is no slapdash construct. The work is fine and painstaking and the textured marbles, melding blushing lavender with grey and even blue is no trick of the imagination. It is a pellmell assault on the senses but some will relish the level of luxury and bold statement this address brings to the hitherto staid Saigon party. Walk in through the gilt-edge marble Nguyen Hue entrance or via Dong Khoi, passing through inner chambers that get more ornate with each step. Expect high ceilings, soaring pillars and sudden bursts of whimsy as with the Italian Baldi clock at the seventh-floor lobby and the oversize velvet chairs. The shades of Burj al Arab continue as you proceed down a grand staircase or up glowing amber lifts. A standard Deluxe weighs in at 42sq m with a marble entrance foyer and dark wood parquet within. Expect 500 thread count Frette linen (going up in suites to 600). You may baulk at the marble but cannot fault them for the linen. There's a free minibar, complimentary WiFi, Nespresso machine for a morning cup of Joe, huge flatscreen TV with DVD, jewellery safe (your laptop may not squeeze in here), a classic bedside clock, mustard settee, pastel wallpaper and easy-access silver one-press light switches. The satin drapes are offset by the floral purple carpet. Toiletries in the bath come from Chopard (and Hermes in Suites). There's a soaking tub, rain shower, twin vanities, and an electronic Japanese potty that will keep the bottom briskly pampered. Three pin crow's feet sockets are the norm. Rooms vary in design themes but are equally plush. 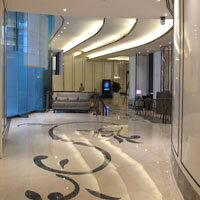 Given the marble finery at the entrance, the in-room feel is comparatively understated and quiet. 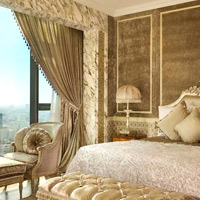 A Junior Suite is vast with mottled blue carpets and mother-of-pearl bird mosaic on the wall. Find an ornate gilt-edged settee, intricate tile-floor bathroom with small standalone tub by the window and a walk-in closet. Another thing that is never lacking, is grand views in all directions. There's 62sq m of stretch space here. The hotel's unique look is the result of a collaboration by four leading Italian furniture designers and there is no dearth of imagination when it comes to beds, fabric, texture and colours. Some rooms are in pastel textures redolent of Louis XVI with strong Parisian echoes, others are muscular and masculine with puckered brown leather headboards and timber floors. This being a designer playground, every room is different. Take your pick. There are versatile function rooms for small corporate meetings too. For larger splashy events opt for the La Scala grand ballroom. Dining includes Italian and Cantonese, while apres-work to loosen those muscles, there's a two-level 1,200sq m spa and wellness facility as well as an outdoor 'resort-style' swimming pool. If this is not glitzy enough, try out the hotel's Rolls-Royce Phantoms or fly off from the hotel's helipad. Alternatively, it is a quick stroll to the river. Situated on the busy riverside boulevard with splendid open views of the snaking waterway is New World’s sister hotel, the 5-star Renaissance Riverside Hotel Saigon, also under the Marriott group. The hotel has 336 rooms, including suites, a rooftop pool, a fitness centre with sauna and massage, and conference facilities. A soaring atrium leading up 21 floors to a skylight is an architectural signature. On the Renaissance Club Floor guests get a stack of complimentary nibbles, cocktails and breakfast as well as free local calls and some complimentary use of a boardroom. The Renaissance Club Lounge provides free Internet access. WiFi is available in public areas. New-look Executive rooms serve up bright blond-wood features, padded headboards, pastel checked carpets, and teal-green bed runners. Expect a flat-screen TV, iPod dock, WiFi (charged, but free for Marriott members) and a small flat safe that is not quite laptop size. There is coffee and tea-making equipment, an iron, and a compact bathroom with a bathtub/shower combination and weighing scales. A throwback to the good old days are the large brass knobs of the radio and music console next to the bed. Deluxe rooms on floors five to sixteen got a soft refurbishment late 2012 and have been smartened up since. The feel of the hotel is laid back and in parts it shows its age. Conference and meeting facilities can take up to about 200 guests in a cocktail setting. The Renaissance has a laid back style and is well positioned on the river with open views that will appeal to holidaymakers. 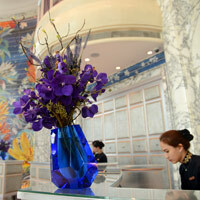 It is a family friendly Saigon hotel that can rustle up business muscle if required. This is a quieter location within a minute's walk to Dong Khoi and all that shopping. And if you're feeling hungry and adventurous, you can stroll upthe riverbank to dine alfresco - or indoors - on the Elisa Floating Restaurant, a large wooden junk with faux sails. 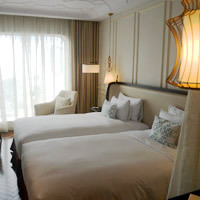 A skip and a hop from the Renaissance is 283-room river-facing Lotte Legend Hotel Saigon (formerly Legend Hotel). This is a simple and elegant pale pink building with neat square windows. Inside is hushed with marbled floors and cream tones. Two enormous metal horses look onto the lobby lounge (a carryover from the previous incarnation) and a fountain under a bright yellow-and-blue skylight surrounded by Roman bathhouse pillars. Spot a Khai Silk outlet. Outside in a garden setting is a circular pool that catches the sun. Old world and square-cut, it is a professionally run place with bright staff and will appeal to corporate travellers not expecting too much of the room product. The rooms – with an old fashioned aesthetic – offer cable television, free WiFi, free local calls and tea and coffee-making facilities. Rooms start at a decent 37sq with the Executive Junior Suite weighing in at 72sq m. Executive guests can breakfast in the Executive Lounge, which also offers express check-in, a meeting room, complimentary afternoon snacks and evening cocktails. Think faded blue carpets, unfussy wooden tables, old-style plug sockets (not three-pin square), free WiFi and, the main offering - the Japanese style toilet seat. There are several restaurants and banquet space that accommodates 500 guests. Families will look forward to the services of the Kid Play Center to get tykes off their hands leaving adults some time for play of their own. Right next door, also facing the river, is the new and very contemporary steel-and-glass 350-room Le Meridien Saigon (mid 2015) that is stirring to life. Walk into a cavernous and minimalist pale grey lobby with red and cream chairs clustered at either end and a central reception backed by a gold mural. the space is devoid of fuss save for a 'cloud' chandelier and soaring silver pillars. The adjacent Latitude 10 is a dark timber-floored lounge and bar, again with a minimal feel and low seating. Overall, the hotel's initial design welcome will soothe some, or prove too stark or cold for others. Hints of Paris-chic are evident in the in-room modernist cube art (a representation of Saigon with a red dot to mark the hotel's location). Take the lift up to the rooms arrayed around a sunlit atrium with mood lights pulsing in changing colours outside every door, and the feel is suddenly hip and mod with a hint of that W DNA lurking underfoot. Purple-charcoal carpets with playful red ribbons provide a motif seen throughout the hotel, and this continues inside the rooms too. A 42sq m Grand Deluxe serves up an efficient work and play space with a see-through black marble glass walled bathroom with soaking tub. There are twin vanities and an overhead shower. The bedroom features a plump mattress, an L-shaped cream sofa, gold-hue lacquer wall murals, a long work desk with data-port and two three-pin multi-plug sockets (there's one by the bed too), flat-screen TV, flat laptop safe and iron. Windows are not floor to ceiling but are high enough to afford plenty of light. A 38sq m Premier Classic River View is a compact space, again with a see-through bathroom wall and a tub facing the bed. Later pop down to the 9th Floor for a splash in the narrow blue-mosaic pool set along a balcony (with a roof overhang alas) to work off any calories and stress. Breezy but not sunny though there is a bright spot under the skylight with water features set apart for a splash and dash. There's a restaurant here and a well-stocked fitness centre too. Suits in search of function space will find five meeting rooms and a ballroom fronting the river that can handle 250 persons. There's a nice meeting foyer with river views. The 533-room New World Hotel Saigon Hotel, close to Ben Thanh market, was the city’s first five-star address and made a splash when it arrived. It is a sprawling, cheerful, building, its former bright mustard exterior replaced by creamy off-white. The spacious lobby tends to be abustle with quick-stepping executive suits and people headed for the lobby Parkview restaurant serving seafood buffets and, living up to its name, looking onto a verdant park through floor-to-ceiling glass walls. There’s shopping too abetted by a handy HSBC ATM machine for quick cash handouts. Expect a pool, a kids’ area, a revamped spa for a Swedish aromatic rubdown, and a fitness centre. Grab a pastry and coffee at the Saigon Bakery and on Sunday mornings enjoy dim sum at Dynasty. 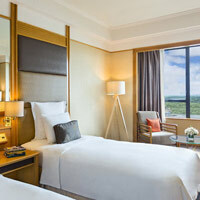 Refurbished Deluxe rooms at the New World Saigon Hotel are tasteful with muted pastel tones interspersed with goldy hues. Also expect a flat-screen LCD television, iron and ironing board, and a modest safe. The toilets offer a bathtub with shower and hairdryer. Also find complimentary tea and coffee-making equipment and a minibar. A 30sq m Executive Club Deluxe Room ups the ante a few notches with a large flat-screen TV, free WiFi, complimentary local calls, and access to the Executive Club Lounge (6am to 11pm). The complimentary breakfast won't hurt either. This bustling hotel offers 2,000sq m of function space and business facilities. Across the road is a pleasant park should you dare to stroll. Sporty types can swim at the open-air pool, play tennis, steam up at the sauna, get a massage, or spa out. The New World is a good pick among Saigon business hotels that doubles easily as a leisure address or a Saigon conference hotels venue. Not far from here at 3 Suong Nguyet Anh Street is the delightfully avant-garde Fusion Suites Sai Gon that manages to meld woody Swiss Alpine cottage decor - complete with an A-frame ceiling - with minimalist Swedish chic. The white pine walls and floors make a simple, elegant, statement with plump white beds offsetting the woody tones. The feel is resorty, Europe-meets-Hokkaido and will put guests in a holiday mood. For businessmen on the go there's two meeting rooms (one can host up to 30 persons), a sauna and gym and a spa for an evening unwind. Pick a 42sq m Corner Suite for more light - not that you need more - and views, or a two-bedroom Family Suite with a queen bed in the master room and a bunk bed for the ankle-biters. The desks are all wood, the chairs are pale pine too and the circular grey rug under the bed is one of the few departures from woody hues and neat angular lines. Expect an in-room kitchenette and perhaps a cool 'hammock' style bathtub. Close by, on Nguyen Hue Boulevard is the modestly stylish, if ageing, Duxton Hotel Saigon that morphed into the Saigon Prince Hotel by mid 2016. Much of the feel remains unchanged. Staff seem to know what’s going on and are anxious to please. The pace is brisk and the lifts are a decent size - unlike the mini cabin trunks that grind up and down the boutique riverfront buildings - with marble floors to boot. The pastel-beige rooms are surprisingly airy and come with cable TV, mini-bar, ironing board and laptop-size safes. The Duxton's older-style boxy TVs have been replaced by large flat-screens at the new Saigon Prince. Expect a reasonable work desk, silk cushions in beige or purple and other touches. WiFi is free. The hotel also manages to squeeze in a small outdoor pool on the third floor set in a timber deck, a gym, and well-equipped spa. There are 16 function rooms and meeting spaces for seminars and corporate get-togethers for ten to 300 guests. The 305-room InterContinental Asiana Saigon comprises three smart reflective glass blocks – one each for the hotel, residences, and offices. This is part of the Kumho complex. Walk into the lobby to find lots of dark woody tones and a chic sitting area. Deluxe rooms feature speckled carpets and wire swirls on the sliding frosted glass doors that open from bedroom onto the bath. An orange runner on the bed enlivens the arrangement with a dash of colour. Expect a 42-inch LCD television, DVD, iPhone dock, sink-in cream leather reading chair, ergonomic work chair, iron and ironing board, laptop-size safe, and a standalone bathtub in a smart but somewhat compact bathroom. WiFi is charged alas but remains free for Elite members of the IHG Rewards Club. The work desk has three-pin square plug sockets. Club InterContinental on the 19th floor serves cocktails with open views of Saigon. An InterContiental Suite offers plenty of wood in a huge well-lit space with parquet floor enlivened by blue swirl carpets and a gold striped bed runner. Find a large dark-wood desk with data port and two three-pin sockets, a large flat-screen TV and a HUGE bathroom with standalone tub. Also expect an iron, laptop-friendly safe, spacious living and dining area with yet another monster TV and a nifty Espresso machine. The InterContinental is a strong contender for Saigon conference hotels business with a grand ballroom capable of holding 600 people banquet or classroom style. To unwind, pick from the spa, or the health club with a 20m outdoor lap pool encased in see-through glass. Cool, chic, and potentially embarrassing save for the well endowed. Service is attentive and brisk and the hotel location is not bad, five minutes from the Park Hyatt. This is a bit up from the much delayed but under construction Senla Boutique Hotel on Hai Ba Trung street. The suave and frequently upgraded Sofitel Saigon Plaza on Le Duan Boulevard, also in District 1 but set a little apart from the thrumming centre, is just minutes away by taxi. The lobby is chic, bright and roomy, featuring two enormous spiralling stacked-wood columns. Opt for a roomy 30sq m Luxury Room (floors 14 to 15) with DVD player, flatscreen TV, free internet surfing and the heady aroma of Lanvin toiletries in the bath. The views won't disappoint either. Enjoy elegant timber floors, patterned headboards, and modular minimalist design with an interesting mix of French and Oriental design. Superior Rooms on lower floors from two to 13, offer eye-popping purple carpeting, black leather headboards and, of course the Sofitel My Bed with pillow menu. This is all a huge jump up from the bland powder greens of yore. The square purple fabric lampshades are a stylish touch. Chill out at the Boudoir Lounge or head to the rooftop pool (and poolside bar) for fine views and undiluted sun. The pool is open to guests 6.30am to 10pm, a generous stretch, unlike many city hotel pools. Have a workout or steam bath before heading to the spa where organic treatments and assorted massages await. For small corporate meetings or mid-size events, the hotel has eight smart function rooms with 30sq m to 400sq m. The Sofitel Saigon Plaza is a smart address and compares well vs New World, Sheraton and other business hotel choices. 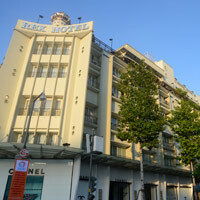 Farther away from downtown, a 15-minute drive to Nguyen Van Chu Street but still in District 1 is the Hotel Nikko Saigon. This construct, next to the Petronas Tower, is a modern high-rise with cubist intent visible in its square window frames. While the Opera House may not be next door, Chinatown is not far from here and new office blocks sprout up by the month. Walk in to a large ultra-modern space-age lobby that is straight out of a science fiction set. All that's missing is Dr Spock. The grey-brown colour scheme runs uninterrupted past the cream marble floors, and up the soaring lobby with its metallic grey-ridge pillars. The place is cavernous and devoid of furniture and designer detritus, minimalism carried to its conclusion, save for a white grand piano in the lounge cafe. Above, suspended light arrays are set in giant discs adding to the moon mission feel. The stark set-up will appeal to businessmen but deter others. However, the place is supremely efficient and relentlessly cheerful. Staff is quick and on the ball. The 335-room hotel serves up rooms that are spacious but equally restrained. In Junior Suites, expect to be enveloped in pastel powder green textures. The colour extends from the walls to the smooth round seats and the cabinets, flush with the walls and barely visible with all the camouflage. This smart but bland serving is enlivened by large white beds and a large flat-screen TV. Expect a round leather-top table, grey this time, a second TV in the living space, free Wi-Fi, and two two-pin plug points. The flat top-loading safe is big enough for a laptop and the nice white marble toilet offers twin vanities, a separate tub and hand shower (no rain shower), if you can find it. The bathroom door blends into the wall completely. The overall appearance is a cross between solitary confinement and splendid other-worldly escape, depending on your point of view. On the fifth floor is the Ren Spa, gym, and large outdoor pool with sundeck. Out in the neon razzle and clamour of Chinatown's Cholon district is the high-rise Windsor Plaza Hotel. It is a gleaming establishment with good city views, reasonable service, ample facilities including a kids' corner and a rooftop pool, a great deal of gratuitous glitz and more than a few quirks. The lobby is on the fourth floor and the hotel actually sits atop the huge and popular An Dong Plaza shopping mall. Consequently, the atmosphere is busy and the place can feel crowded at times. There are 405 rooms and suites. Neat and simple 29sq m Deluxe rooms come with basic amenities and a 32-inch LCD TV, while 40sq m Junior Suites offer 40-inch LCD TVs. Broadband internet access is available in all rooms, and free WiFi is offered in public areas. Executive room guests get access to a private lounge with complimentary breakfast. There is the America Discotheque for itchy feet and the Windsor Spa & Massage has 20 treatment rooms with a nail salon next door. On central Le Loi boulevard, housed in the Saigon Center, you'll spot the Sedona Suites Ho Chi Minh City with suites as well as one-to-three-bedroom apartments (with kitchen, furniture, king-size bed, satellite TV and broadband and WiFi), swimming pool, tennis, basketball, sauna and business centre. 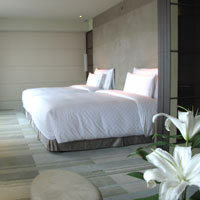 A little out of the way is the 290-room Ramana Hotel Saigon (previously the Amara). The more traditional Ramana offers a broad range of facilities including a business centre, fitness room, sauna and spa, outdoor pool, and WiFi. Rooms come with basic amenities including internet access. At the 333-room Hotel Equatorial Ho Chi Minh City opt for an Equator Club Deluxe that is pitched a cut above the more Plain Jane lower categories. Expect personalised check-in, breakfast and evening cocktails at the Club Lounge, 32-inch LCD TV, DVD, a pillow menu for insomniacs, and free WiFi and internet. Look forward to a fitness centre, massage services, a 24m pool with a sunken bar, slot machines, KTV, several restaurants, and generous banquet facilities. 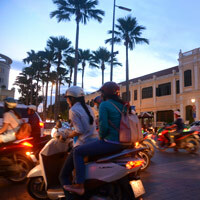 One of Ho Chi Minh City’s enduring charms is its smaller characterful hotels, often still housed in historic buildings. On Lam Son Square, next to the Park Hyatt, the 80-room Hotel Continental Saigon has been around since 1880, a similar vintage to the delightful Notre Dame Cathedral close by. Like the Rex, it is owned by the ubiquitous Saigon Tourist group. A popular haunt for spooks and journalists during the Vietnam War, the elegance was graciously fading for a while but a smart renovation has transformed the place and staff is ever attentive and cheerful. Further renovations were completed by late 2015. The Continental offers a splendid downtown location right at the head of Dong Khoi Street. The building is an old world low-rise set around a courtyard flanked by assorted shops. Rooms are in a classical mould with dark blue carpets, lots of gleaming wood, flat-screen TVs, free WiFi, and coffee-making facilities. Expect a work desk with Edwardian chair, old fashioned furniture and cupboards and plenty of space. Suites may offer walled-in verandah alcoves (with access through wooden arches) to read the morning paper. Compact bathrooms offer a tub and shower with hairdryer. Try to book a third-floor room overlooking the Opera House. These rooms are seemingly large enough to double as skating rinks - with all the attendant musty decor and feel. You will find CNN on the TV but not much else, a dimmer light, and a few two-pin sockets. Heineken beer in the mini-bar will set you back D65,000 (US$2.50). International travellers can use the extension cord thoughtfully provided on the desk. It has three, three-pin sockets. There's a notebook or jewellery safe. If you part the large heavy drapes you can peek across to the Opera House. Step out to the balcony (of sorts) if you have the moxie and the mood. The room is an unadorned classic with a fading elegance that will appeal to many. The hotel has no swimming pool but it does have a somewhat whimsical business centre and massage services that may help your visit take a colourful turn. The hotel has a bright, airy lobby complete with grand piano. Breakfast is decent with bespoke eggs. Mark this one down as a good Saigon heritage hotels choice but watch out for street noise and perhaps the occasional karaoke wedding party. The enduring and now all-new Rex Hotel's utterly mad Roof Garden with its cavorting plaster elephants still entertains on pleasant, breezy evenings. Access has been partially closed off with metro train diggings and it can be a small adventure getting there for the moment. The landmark Rex, on Nguyen Hue Boulevard is centrally located, close to the Opera House and overlooking the magnificent City Hall. It has been supplemented by a brand new East Wing with 70 or so smart rooms and a sleek white-marble lobby – surrounded by gleaming high fashion designer brand outlets from Burberry, Salvatore Ferragamo, Cartier, Rolex and the like – a far cry from the dimly-lit musty welcome of the old wing. The original hotel was constructed around a large open courtyard called the Rose Garden, now a welcoming outdoor dining area with tables, chairs and sun umbrellas. Long dark corridors that radiated out from the lobby have finally been lit up properly and the lobby itself has been amazingly transformed. The dim and musty Rex old West Wing charmed in its heyday. All it needed was some 100-watt bulbs, SWITCHED ON. Now modernity beckons as the West Wing transforms. 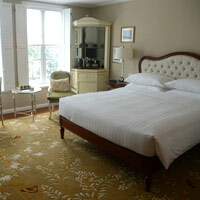 The new East Wing rooms are bright and decked out in pastels with Vietnamese silk runners. Expect electronic room cards, parquet flooring, double-glazed windows to keep out traffic noise, a work desk, flat-screen TV, iron and ironing board, a fire sprinkler (a new addition), separate shower and bathtub (plus bidet), a hair-drier and laptop-size safe. WiFi is free. The Rex has been chugging along since 1927. It has lost its old world appeal (and the taxi ladies of yore who danced with foreigners for an hourly fee) but has gained fresh contemporary clout. Need a massage? No problem. Head up to the La Cochinchine Luxury Spa and fitness area where you'll be greeted by two swimming pools, gym, tennis courts and a raft of activities from yoga and aerobics to modern dance and wellness treatments. On to some genuine Saigon heritage hotels. Our pick of the oldies would be the Grand Hotel, a beautiful whitewashed corner property half a block from the river, right behind the Renaissance. The building came up in 1930. This three-star property moved up to four stars and now expects five. In 1998 a new Luxury Wing was added to the colonial Ancient Wing. And in November 2011 the entire shebang was hugely upgraded with a high-rise New Wing (with a rooftop river-view cafe) all slathered in white marble so painstakingly polished you may skate across the lobby if you pause your brisk walk too abruptly. From marble inlay lobby three tiny lifts chug up to the rooms. Deep blue carpets lead through the corridors to rooms with wooden floors, flat-screen TVs, work desk with free WiFi, light dimmers, and an air-conditioning switch that needs to be found and turned on. The bathroom offers a hairdryer, a brightly-lit mirror, bathtub and separate rain shower glass cubicle and a few toiletries including shampoo and conditioner. There is an electric kettle for coffee or tea and shoeshine wax for scuffed shoes. Expect a reasonably sumptuous breakfast in the spacious Saigon Palace restaurant. For slot machines and roulette expect the Club D'Palm and for the fitness inclined, a gym and spa. Staff is friendly and quick to assist and electronic proximity card keys are a new addition. Ancient Wing rooms in the low-rise heritage section are more expensive and offer dark-wood furniture, gleaming wooden floors and a terrific bathroom with separate shower, bathtub and hairdryer. Expect tall windows with brocade satin curtains, golden bed runners, flat-screen TVs, spacious living area and old style classic dial phones (albeit with buttons). They also have a GIANT safe that could hold an elephant – or your mother-in-law. There’s a small and pleasant courtyard pool and all rooms have internet access. A splendid experience is provided by the tiny lift, rivalled only by the Majestic, which has a cupboard-size contraption in which drawing in a deep breath is a major accomplishment. The wonderfully colonial camp Hotel Majestic, like its sister, the Grand, is run by Saigon Tourist. It offers a new wing as well. The hotel was built in 1925. The rooms feature wooden parquet floors, flat-screen TVs, dim lighting – which seems very de rigueur in Saigon – and a small safe. Internet is available in-room. On executive floors, avail of broadband, executive breakfasts, afternoon tea, shoeshine service and late checkout until 3pm. The Majestic also offers an outdoor swimming pool, a fitness centre and spa (where an hour's massage will cost US$30), and a 461sq m ballroom. There is a casino too. There are several options for wining and dining, including a breezy rooftop bar. Hotel Majestic is riding the green wave with water and energy conservation programmes in place. And, of an evening, an acoustic band will strike up in the old world lobby with its stained glass panels and Victorian chairs. Some distance away (by Ho Chi Minh City standards) in the direction of the airport, a 15-minute taxi-ride will bring you to the Eastin Grand Hotel Saigon (formerly Movenpick, which took over from Omni). This five-star hotel has an interesting history. It was a US government building until 1975 when its occupants departed, presumably not all on the last helicopter out. Omni took over in 1994, adding a grand lobby, sweeping staircase and rooftop pool, to convert the lowrise apartment into a quality hotel with ample conference facilities. This means that unlike standardised modern hotels, every room here is slightly different in shape and orientation. In mid 2008, the hotel was taken over by Moevenpick Hotels and Resorts. After extensive renovations the hotel reopened in August 2010 with a jaunty new stride, its 278 rooms graduating from "stately to chic". It is now a thoroughly contemporary address under the Eastin brand. Walk into a high ceiling minimalist white marble lobby with four square pillars at the centre with cutouts and pale blue lighting emanating from within. This is matched by a few mod purple velvet seats. A staircase rises up grandly to one side. It is all pleasantly minimalist. 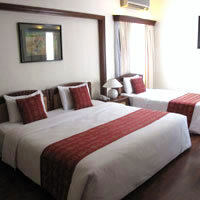 Spacious rooms serve up mustard patterned carpeted floors, slim black cabriole leg beds, bright bed runners, flat-screen 37-inch LCD TVs, silk curtains and large desks with data-port and all manner of connectivity. The rooms are vast (34sq m to 70sq m - the top floor Executive Suites with large bathtubs and black swirl carpets), the toilets, with rainshower, bright but rather compact. Also expect a gym, a spa and a circular outdoor pool. There are several F&B options including Chinese. Eastin Grand Saigon is very much among the better Saigon business hotels though its location a little way out makes it more of an airport hotel good for dashes to manufacturing plants and outlying offices. It has good meetings facilities with a grand ballroom that can host 460 for cocktails or 380 for a banquet. Consider it seriously if you are hunting for quality Saigon conference hotels with versatile space for corporate meetings. Just up the road from here is the Parkroyal Saigon Hotel (formerly a Novotel), a modern, four-star atrium-style hotel with pool set in a courtyard, club floors for executive travellers, and small meeting facilities. It is a five minute drive from Tan Son Nhat International Airport and the Tan Binh convention centre. 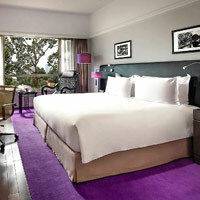 A fresh swirl of renovations by December 2011 sees the hotel emerge with cooler tones and generous dollops of purple. A Superior room is about 33sq m in earth tones with a fabric headboard for the bed, clean black cabinets, blue-line carpets, good size desks and free WiFi. Also find mod-cons like data-port with HDMI and USB ports, and two three-pin multi-plug sockets. The in-room safe is smallish (use it for jewellery and small cameras) as is the very compact toilet with the bathtub and shower combined of necessity. But it is clean and functional. The Orchid Deluxe rooms go up to 37sq m with a larger TV, a lavender wall framing the bed, blond-wood desk and sideboard, a glass partition separating a more spacious bathroom with a separate shower cubicle. The shower is handheld though. Business suits can easily fit their laptops into the safe here. An elegant and contemporary option is the Vissai Saigon Hotel (formerly StarCity Saigon), a younger four-star, with tasteful 33sq m rooms and complimentary WiFi. Vissai can manage small corporate meetings in Saigon for 20 or stretch to conferences for 400. 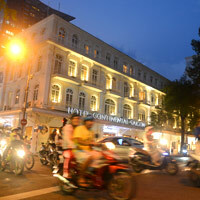 Ho Chi Minh City budget hotel and value stay options are vast though prices are climbing rapidly. Service and facilities can fluctuate dramatically. The three-star Bong Sen Hotel Saigon is a very decent downtown Saigon good value hotel option in the Dong Khoi vicinity with simple but nice rooms, clean bathrooms, TV, minibar, free high speed internet and WiFi, and a big safe for laptops. WiFi is available at the business centre and lobby lounge too. Standard rooms start at a compact 25sq m while Superiors are 28sq m with en suite bathrooms, with a tub and hand-held shower plus useful toiletries, a hairdryer, and bathrobes. As with several local hotels, "couples wishing to share a room must provide proof of marriage". This quirky Vietnamese law holds particularly true of foreigners with Vietnamese partners. 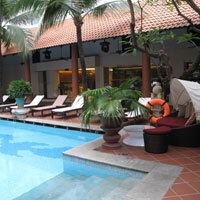 There is no pool, but guests are able to use the pool at Palace Hotel Saigon, its sister property about two minutes away. Enjoy a steam room, sauna and massage too. There are small conference facilities as well. The Bong Sen Hotel Annex (also called Bong Sen 2) at 61-63 Hai Ba Trung is an interesting budget alternative. with decent rooms, a travel shop and business centre. Next to Bong Sen on Dong Khoi is the easy-to-miss Hotel Catina Saigon (opened 2009) in a slim building that belies the inner marble and tasteful contemporary design. Walk in through the narrow air-conditioned corridor lined with gemstone and jewellery displays. Rooms are in pale pastel with large flat-screen TVs, free WiFi, a smart long gleaming wood work desk, cream carpets, notebook-size safes, hairdryers, and compact toilets with tub and shower. Keep in mind the cheapest Deluxe rooms start at 26sq m (with no windows). Continental breakfasts are complimentary as are morning newspapers. If your budget is tight, Catina is definitely worth a look. Room rates early 2017 started at around just US$53. On Dong Khoi too is the Huong Sen Hotel where a traditional dark-wood lobby awaits with ornate chairs featuring inlay work and intricate carving. Expect a pool and sauna. WiFi is free. 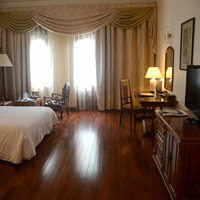 Good rooms with parquet flooring and a great location smack in the middle of all that Saigon shopping madness. This is a value proposition but not cheap. An interesting Saigon budget hotel option is the Unique Saigon Hotel (formerly Saigon Boutique Hotel), a cross between an art deco layer cake and an art gallery. The place is reasonably central (though District 1 is a huge sprawl) at 57 Pham Viet Chanh, 10 minutes from the Opera area and 15 minutes from Ben Thanh market. The 20 odd rooms are neat, if unremarkable and somewhat spartan, and now feature flatscreen LCD TVs and some dark wood furniture. The rates are very affordable (starting from just US$26 or so for a Superior double with breakfast in 2017) and can be negotiated down further during summer or monsoon months. There is a small business centre and WiFi is wondrously free. Unique Saigon is not to be confused with the 18-room lowrise Little Saigon Boutique Hotel on Le Loi close to the Opera House and Ben Thanh Market areas. The 28sq m rooms are cheerfully kitted out with colourful cushions and bed runners plus flatscreen TVs and DVDs and WiFi. Also find a mini-bar, hairdryer, and safe. This place is a bit more cheery and rates start from US$38. 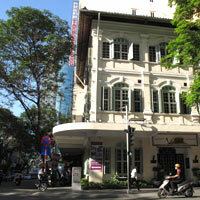 Or try the small but friendly The Spring Hotel at 44-46 Le Thahn Ton Street, close to the Opera. The 54-room Spring Hotel offers basic but clean and traditional accommodation on a quiet side street just a few minutes’ walk from the shops and hustle of Dong Khoi, a few blocks from Notre Dame Cathedral. The tiny lobby crams in more ersatz Rome and Florence – complete with plaster busts, marble pillars, and sweeping staircase – than a nouveau riche Hong Kong home. Higher floors afford nice views of the city. The rooms are bright with rattan furniture, air-conditioning, satellite TV (that includes Japanese channels) and a mini-bar. This is a well regarded Saigon budget hotels choice with friendly English-speaking staff. Also a short walk from Notre Dame heading away from downtown is the neat and clean three-star Victory Hotel, popular with European groups. There is a small but pleasant pool on the sixth-floor roof, a spa, and a fitness centre. There are 160 rooms, some served straight up with traditional wooden furniture and modern amenities like LCD TVs. Deluxe rooms start at 30sq m while Luxury rooms start at 45sq m with blue carpets, city views, welcome fruit baskets, air-conditioning, and showily carved wooden beds with ornate headboards and Baroque gilt-edge flourishes. A bit campy, if you like that sort of thing and wish to pretend you're Louis XVI (of course, before the execution). There are also conference facilities for up to 300 persons. Expect free Wi-Fi. The three-star Hotel Saigon (opposite the Sheraton) has free WiFi in the room and while the exterior is unprepossessing, the rooms are none too shabby. Moving upscale a bit, the 144-room Palace Hotel Saigon is four stars and looks the part with a crisp minimalist white-marble lobby and contemporary decor. 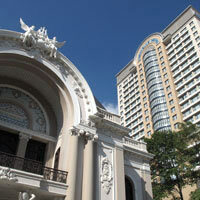 The hotel is well located on Nguyen Hue avenue. Rooms are also smart and come with flat-screen TV, minibar, small camera-size safe, hairdryer, and tea and coffee-making facilities. Internet is available and Wi-Fi is free. Breakfast is included in the room rate. The hotel has meeting facilities, there is a business centre, a small pool, three restaurants, a gym, and a spa that is open until 2am. The Palace Ballroom handles MICE (meetings, incentives and exhibitions) business with conference and small meetings facilities for up to 280. A good value hotel. Also on Nguyen Hue, the Oscar Saigon Hotel has considerably spruced up with a smart marble lobby, clean rooms, fresh carpeting and free WiFi. Its four-star status is proudly emblazoned in bronze at the entrance. The Oscar also manages to rustle up a health club with massage and sauna and its penthouse Starlight Restaurant doubles as a wedding and banquet location with wraparound views of the city and City Hall. Starlight is no longer a disco and the taxi ladies (dancing companions) are, alas, gone. In-room expect large metal safes with large and threatening combination spin locks (that don't work) straight out of Butch Cassidy and the Sundance Kid. These safes have been reconditioned to work with a key that has to be obtained from reception at no charge. Oscar Deluxe and Oscar Elegance rooms are smart with timber flooring underfoot with flat-screen LCD TVs. The bathroom offers a hair drier, a moulded bathtub with shower and toiletries. Rooms boast satellite TV and comfy beds with remote-controlled aircons. This is a good Saigon budget hotels choice for business or pleasure though prices can climb sharply in season. Rates may start as low as US$40-$50. The best street views are from rooms ending in 01 or 02. Summing up, cheap and cheerful. Right across the road, the breezily unabashed Kimdo Royal Hotel Saigon greets you at the entrance with Roman busts and intriguing white plaster statues. Inside it flaunts its health club offering massage, sauna, steam bath, fitness centre and Jacuzzi. The four-star Kimdo (a little pricier than Palace Saigon) offers conference space as well as a business centre. It has smart rooms with gleaming wooden parquet flooring, comfy beds and bright cushions. Expect a big safe, spacious rooms, a work table (with free WiFi) and flat-screen TV. The bathroom is compact with a combination tub-and-shower arrangement. Kimdo has helpful staff and is a reliable address downtown if you don't mind something a tad cheesy. Kimdo is a value hotel popular with a certain certain class of businessmen and rates early 2017 started as low as US$50. The Norfolk Hotel on Le Thanh Ton Street in District 1 not far from Ben Thanh market is a cheerful businesslike place and Australian-run. There is complimentary internet (broadband in rooms and WiFi in public areas), a business centre, a health club and baby-sitting services. 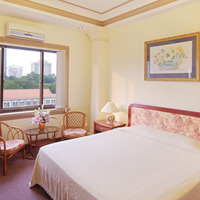 It is a good value Saigon hotel with rates starting from around US$95. 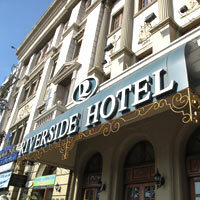 And next door to the Renaissance, is the three-star Riverside Hotel which, as the name declares, faces the river. It is a characterful low-rise with enough personality to lure a relaxed leisure tripper. There are 51 rooms, including suites, with satellite LCD TV, data-port, free WiFi, in-room safe, mini-bar, and hairdryer. Deluxe rooms start at 32sq m. Breakfast is usually on the house. Also expect sauna and massage facilities. That's the A-Z of our Saigon business hotels review with some budget options for the tight of wallet. Get there quick before yet another KFC opens. Room rates may attract a 5 percent service charge and a 10 percent VAT. Any rates listed below are an average of the best available internet rates (BAR) as a rule of thumb only. Check hotel websites for steep seasonal discounts. 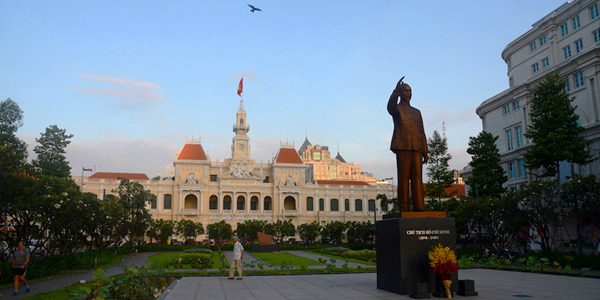 In general room prices in Ho Chi Minh City will start from around US$80 a night at three-star establishments, US$110 a night at good four-star hotels to US$245-$350 at five-star or luxury addresses. Budget hotels are much cheaper. Exchange rate around US$1=D22,500 Vietnam dong. Caravelle Saigon. Tel: [84-8] 3823-4999, fax: 3824-3999, (e-mail: hotel@caravellehotel.vnn.vn or www.caravellehotel.com). Fusion Suites Sai Gon. Tel: [84-8] 3925-7257, (e-mail: reception@fusionsuitessaigon.com or fusionsuitessaigon.com/). Hotel des Arts Saigon MGallery Collection. Tel: [84-8] 3989-8888, fax: 3985-9999, (www.hoteldesartssaigon.com/). Hotel Equatorial Ho Chi Minh City. Tel: [84-8] 3839-7777, fax: 3839-0011, (e-mail:info@hcm.equatorial.com or www.equatorial.com/hcm/). Hotel Nikko Saigon. Tel: [84-8] 3925-7777, fax: 3925-7766, (e-mail: sales@hotelnikkosaigon.com or www.hotelnikkosaigon.com). InterContinental Asiana Saigon. Tel: [84-8] 3520-9999, fax: 3520-9955, (www.ihg.com). Lotte Legend Hotel Saigon. Tel: [84-8] 3823-3333, fax: 3823-2333, (www.lottehotel.com/saigon/en/). New World Saigon Hotel. Tel: [84-8] 3822-8888, fax: 3823-0710, (new-world-saigon.hotel-rn.com/). Park Hyatt Saigon. Tel: [84-8] 3824-1234, fax: 3823-7569, (e-mail: saigon.park@hyatt.com or saigon.park.hyatt.com). Ramana Hotel Saigon. Tel: [84-8] 3843-9999, fax: 3843-8888, (e-mail: info@ramanasaigon.com or reservation@ramanasaigon.com or www.ramanasaigon.com). Renaissance Riverside Hotel Saigon. Tel: [84-8] 3822-0033, fax: 3823-5666, (renaissance-hotels.marriott.com). Saigon Prince Hotel. Formerly Duxton. Tel: [84-8] 3822-2999, fax: 3824-1888, (www.saigonprincehotel.com/). Sedona Suites Ho Chi Minh City. Tel: [84-8] 3822-9666, fax: 3822-9229, (www.sedonahotels.com.sg/hochiminhcity/). Sheraton Saigon Hotel & Towers. Tel: [84-8] 3827-2828; fax: 3827-2929, (e-mail: sheratonsaigon@sheraton.com or www.starwoodhotels.com/sheraton). Sofitel Saigon Plaza. Tel: [84-8] 3824-1555, fax: 3824-1666, (e-mail: H2077@sofitel.com or www.sofitel.com). The Reverie Saigon. Tel: [84-8] 3823-6688, (e-mail: info@thereveriesaigon.com or www.thereveriesaigon.com). Windsor Plaza Hotel. 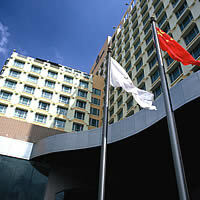 Tel: [84-8] 3833-6688, fax: 3833-6888, (e-mail: services@windsorplazahotel.com or www.windsorplazahotel.com). Hotel Continental Saigon. Tel: [84-8] 3829-9201, fax: 3829-0936, (e-mail: continentalhotel@vnn.vn or www.continentalvietnam.com). Hotel Majestic. Tel: [84-8] 3829-5517, fax: 3822-9744, (www.majesticsaigon.com/). Grand Hotel. Tel: [84-8] 3823-0163, fax: 3827-3047, (e-mail: info@grandhotel.vn or www.grandhotel.vn). Rex Hotel. Tel: [84-8] 3829-2185, fax: 3829-6536, (e-mail: rexhotel@rex.com.vn or www.rexhotelvietnam.com). Eastin Grand Hotel Saigon. Formerly Movenpick. Tel: [84-8] 3844-9222, fax: 3844-9198, (www.eastinhotelsresidences.com). Parkroyal Saigon. Tel: [84-8] 3842-1111, fax: 3842-4363, (e-mail: enquiry.prsqn@parkroyalhotels.com or www.parkroyalhotels.com/en). Vissai Saigon Hotel. Formerly StarCity. Tel: [84-8] 3999-8888, fax: 3995-8888, (www.vissaisaigonhotel.vn/en/). Bong Sen Hotel Saigon. Tel: [84-8] 3829-1516, fax: 3824-6894, (e-mail: reservation@bongsenhotel.com or bongsenhotel.com). Bong Sen Hotel Annex (also Bong Sen 2). Tel: [84-8] 3823-5818, fax: 3823-5816 (e-mail: bongsen2@hcm.vnn.vn or www.hotelbongsen.com). Hotel Catina Saigon. Tel: [84-8] 3829-6296, fax: 3829-6291, (e-mail: info@hotelcatina.com.vn or www.hotelcatina.com.vn). Huong Sen Hotel. Tel: [84-8] 3829-1415, fax: 3829-0916, (e-mail: huongsen@hcm.vnn.vn or reservation@huongsenhotel.com.vn or www.huongsenhotel.com.vn). Kimdo Royal Hotel Saigon. Tel: [84-8] 3822-5914/5, fax: 3822-5913, (e-mail: hotel@kimdohotel.com or www.kimdohotel.com). Little Saigon Boutique Hotel. Tel: [84-8] 3521-8464, (www.littlesaigon.com.vn/). Norfolk Hotel. Tel: [84-8] 3829-5368, fax: 3829-3415, (e-mail: info@norfolkhotel.com.vn or norfolkhotel.com.vn). Oscar Saigon Hotel. Tel: [84-8] 3829-2959, fax: 3822-2958, (e-mail: oscarsaigonhotel@oscar-saigonhotel.com or www.oscar-saigonhotel.com). Palace Hotel Saigon. Tel: [84-8] 3829-2860, fax: 3824-4229, (e-mail: reservation@palacesaigon.com or www.palacesaigon.com). Riverside Hotel. 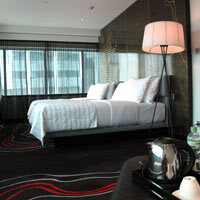 Tel: [84-8]] 3822-4038, fax: 3825-1417, (e-mail: hotelriversidesg@hcm.vnn.vn or www.riversidehotelsg.com). Saigon Hotel. 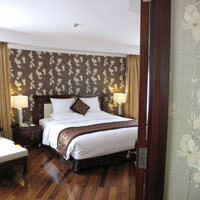 Tel: [84-8] 3829-9734, fax: 3829-1466, (e-mail: saigonhotel@hcm.vnn.vn or www.saigonhotel.com.vn). The Spring Hotel. Tel: [84-8] 3829-7362, fax: 3822-1383, (e-mail: springhotel@hcm.vnn.vn or springhotelvietnam.com). Unique Saigon Hotel. Formerly Saigon Boutique Hotel. Tel: [84-8] 3833-0540, fax: 3832-2470, (theunique.vn/saigon/). Victory Hotel. Tel: [84-8] 3930-4989, fax: 3930-3604, (e-mail: victoryhotel@hcm.vnn.vn or www.victoryhotel.com.vn).